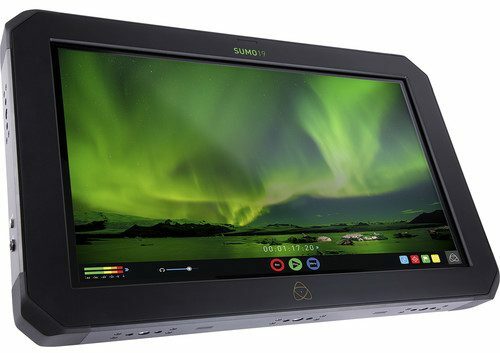 The Atomos Shogun Inferno is a 7″, 1920 x 1200 on-camera recording monitor that combines 4K recording with a 10-bit FRC panel that supports native display of HDR (log) footage as well as high brightness viewing of Rec. 709 footage. The included accessory kit includes a sunhood, two NP-F750 batteries, fast charger, D-tap power cable, control cable, USB 3.0 docking station, four additional Master Caddy SSD/HDD cases for a total of five, and a custom HPRC hard case. It utilizes 4K HDMI and 12G-SDI inputs to support clean output signals at resolutions up to UHD 4K (3840 x 2160) at 60 fps, recording it to 2.5″ SSDs using 10-bit, 4:2:2 Apple ProRes and Avid DNxHR codecs. The Inferno, unlike the similar Shogun Flame, supports Quad 3G-SDI input. It even supports DCI 4K (4096 x 2160) raw video streams over SDI from select Sony and Canon cameras, encoding it as ProRes/DNxHR files.